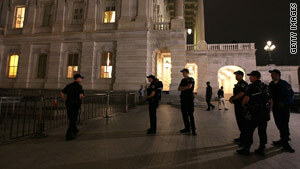 Capitol Police officers stand outside the Capitol Building Sunday evening before the vote on the health care reform bill. Washington (CNN) -- Democratic congressional leaders Wednesday demanded Republicans join them in condemning a spate of threats and vandalism that has followed Sunday's vote on a sweeping overhaul of the U.S. health care system. More than 10 Democrats have reported trouble since the weekend vote, House Majority Leader Steny Hoyer told reporters. Windows have been smashed at Democratic offices in at least three states, and federal agents were investigating whether a cut gas line at the home of a Virginia congressman's brother was related to the lawmaker's yes vote. Democracy "is not about violence," Hoyer said at a news conference with South Carolina Rep. James Clyburn, the No. 3 Democrat in the House of Representatives. "Both of us believe that to remain silent in the face of such activity gives the impression of either condoning or sanctioning such actions," added Hoyer, D-Maryland. The top Republican in the House, Minority Leader John Boehner, told reporters that he has urged opponents to demonstrate legally. "I've made statements that I understand people are angry, but violence and threats are inappropriate and irresponsible," the Ohio congressman said. "If people are angry, they ought to register to vote and get involved in a campaign." The white-hot rhetoric that dominated the last several months of debate on the historic health care bill culminated in unruly protests by the Tea Party movement at the Capitol over the weekend. Three African-American House Democrats, including civil rights leader Rep. John Lewis of Georgia, reported protesters shouted racial slurs at them and spit at one of them, while Rep. Barney Frank, D-Massachusetts, an openly gay House member, had anti-gay slurs yelled at him. One House member mentioned a map on the Facebook page of former Republican vice presidential candidate Sarah Palin during a Wednesday meeting on safety concerns, a Democratic source said. The map shows 20 House Democratic political targets believed to be vulnerable in the upcoming midterm elections -- some have already announced their retirements. Their home districts are marked with cross hairs. Mention of the map brought audible groans to the room, the source said. Since the vote, an Alabama blogger has launched a "window war" against Democrats and has kept a tally of the recent incidents of damage, including ones in upstate New York, Arizona and Kansas. A message left for Michigan Democrat Bart Stupak, whose last-minute decision to support the bill helped give Democrats the votes it needed to pass, warned that "there are millions of people across the country who wish you ill, and all of those thoughts projected on you will materialize into something that's not very good for you." Clyburn, who is African-American, said he has received a fax in his office with a picture of a noose drawn on it and had threatening telephone calls at his home. Hoyer told a news conference that "a significant number, meaning over 10" lawmakers had reported either threats, vandalism or other incidents. Capitol police officials have briefed House Democrats on reporting suspicious or threatening activity and taking precautions to avoid "subjecting themselves or their families to physical harm," he said. Rep. Louise Slaughter, D-New York, said her Niagara Falls district office had a brick thrown through one of its windows and a message that referred to "snipers" was left on one of her campaign offices. In a written statement, she said GOP leaders have been "fanning the flames with coded rhetoric." And Maryland Rep. Chris Van Hollen blamed Republicans for encouraging heated rhetoric over the bill. "There's a real feeling that some of the comments from the Republican leaders and Republicans are not tamping down the fire, they are throwing fuel on the fire. And that is totally inappropriate," Van Hollen said. But Boehner, who compared the legislation's passage to "Armageddon," said Democrats had not complained to him that Republicans haven't been quick enough to condemn the threats and vandalism. Clyburn said his wife has forwarded the phone numbers from the calls to law enforcement agencies. Slaughter said federal agents and local authorities were investigating the threat and vandalism at her offices. And in Virginia, Albemarle County fire marshals and the FBI are looking into the slashing of a propane gas line outside the home of Rep. Tom Perriello's brother, the congressman's office said. A Perriello aide told CNN that a line to the propane tank on the brother's gas grill had been severed after the brother's home address was posted online by a Tea Party activist. Lee Catlin, a spokesman for the fire marshal's office, said the incident "did not involve an immediate threat to occupants of the residence" but would disclose no details. The county joined the investigation late Tuesday after a request from the FBI, Caitlin said. "Officials are taking the incident very seriously and conducting a vigorous investigation," he said. Conservative talk show host Glenn Beck told his radio audience Monday that Democrats who supported the bill would be remembered as "an enemy of the republic" and "an enemy to the Constitution." But he urged viewers of his Fox News television show Wednesday to avoid violence, because "radical" supporters of the Obama administration are counting on such attacks to discredit their opposition, he said. "Not only is it completely nuts and wrong, it's exactly what they want," Beck said. He told viewers, "They are begging for it. You are being set up." But in Kansas, Democrats in Wichita are seeking to raise money over a brick thrown through the window of the party headquarters. "At first, we thought our office was just the object of a random act of bitter violence, but now we know that's not the case," said the Sedgewick County Democratic Party's Web site. "This attack was instigated, encouraged and directed by an ultra-right wing blogger and similar events occurred all over the country." The Web site item asked for donations to "help us get back to work." CNN's Deirdre Walsh, Dana Bash, Lesa Jansen and Tom Cohen contributed to this report.